Our insulated tools are manufactured according to the VDE standards. At the time of manufacturing the tools are tested upto 10,000V but they are certified with 1000V. All ranges of tools are available for selecting the tools required for your application. 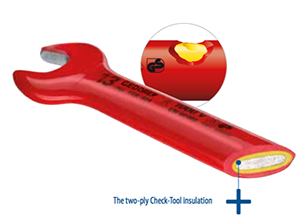 Our insulated tools come with two ply check-tool insulation. This is used to identify when the product life comes to an end and it requires a change of tool.